The vision system detects bends in IC lead terminals. The XG Series simultaneously inspects the top and sides of an IC surface with just one camera by using prismatic reflection. The Trend Edge Stain tool detects bends in the leads by comparing the edge of a lead to the reference model created against the original image. Previously, geometric calculations were used to identify IC leads that were not positioned correctly. Programming was long and users who were not familiar with the systems operation could not make adjustments. 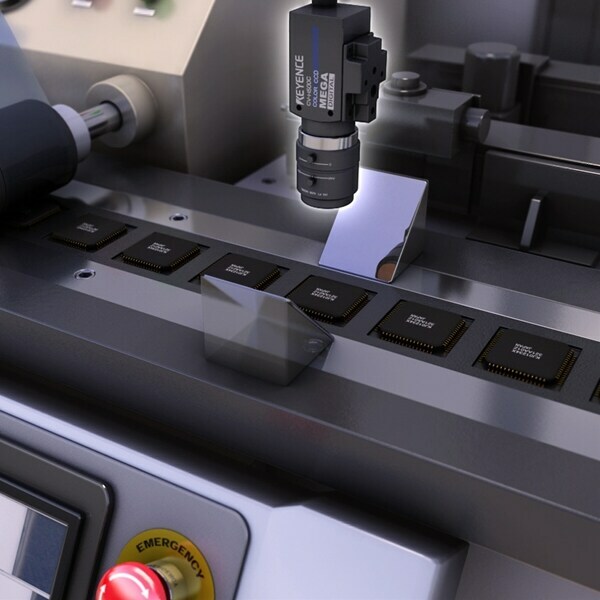 The Trend Edge Stain tool of the XG Series system is able to automatically pin-point variations in the position of objects and any user can easily adjust tolerances to meet production standards.